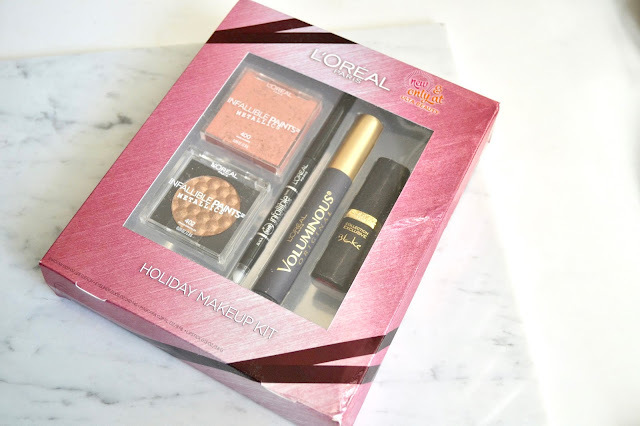 Today I have a closer look at a holiday set from L'Oreal that is exclusively sold at ULTA. 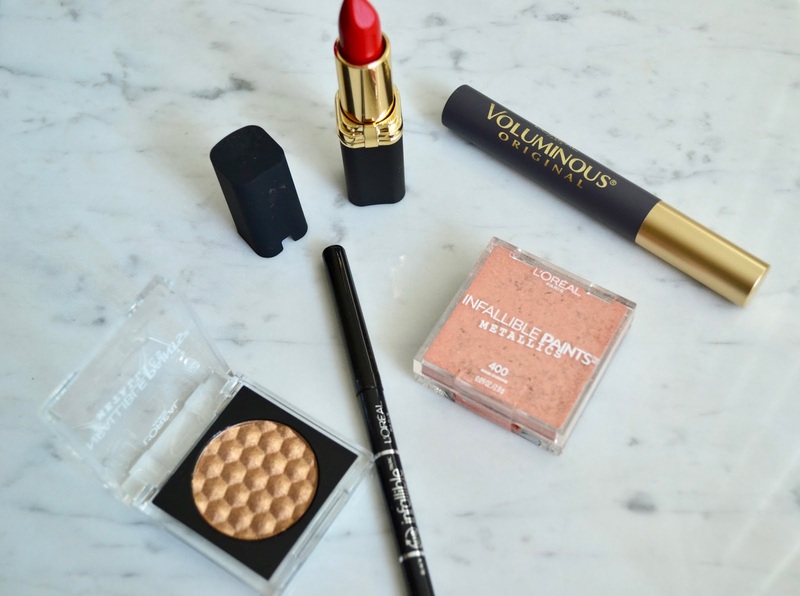 There are 5 products in the kit that comes with everything you need to complete your holiday look. You can definitely see there are some classics from L'Oreal mixed in with some trendy shades. This is a great set to gift someone or gift yourself since you get a nice variety. See swatches and more below! - Infallible Paints Metallic Eye Shadows in Brass Knuckles and Rose Chrome (which did unfortunately arrive broken). Even though the Rose Chrome Eye Shadow broke, I was able to swatch it so you can get an idea of what it looks like. Both shadows have a gorgeous metallic finish and blend out nicely on the skin. 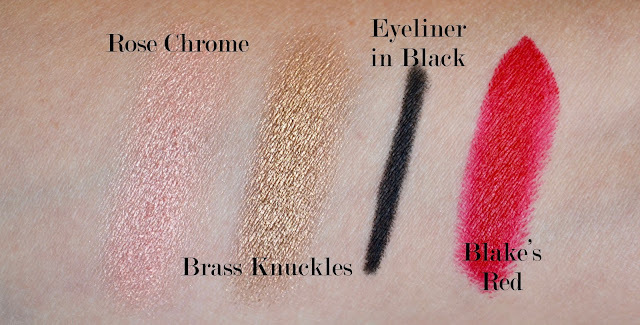 The eyeliner is definitely pigmented and would stay pretty good in the waterline or on the lids. The lipstick is the perfect holiday red shade that will pop with any makeup look. And last, the mascara is a L'Oreal favorite so that is also a win to complete the kit. 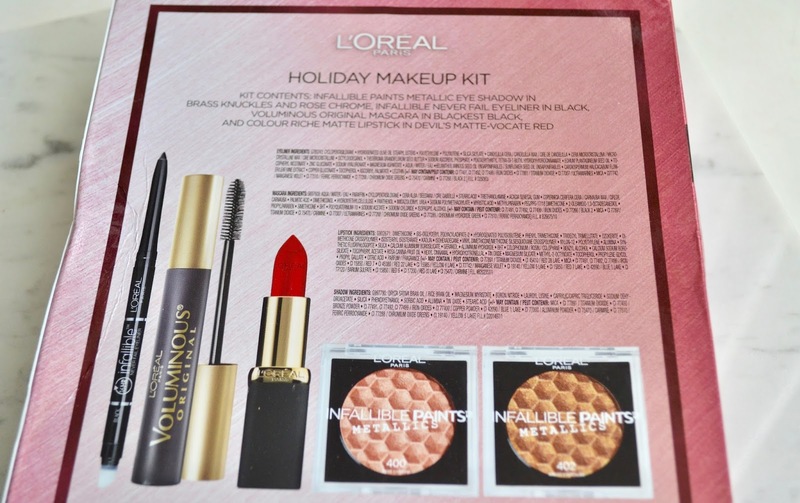 L'Oreal Holiday Makeup Kit retails for $29.99 (a $43.95 value) and can be found exclusively at ULTA.